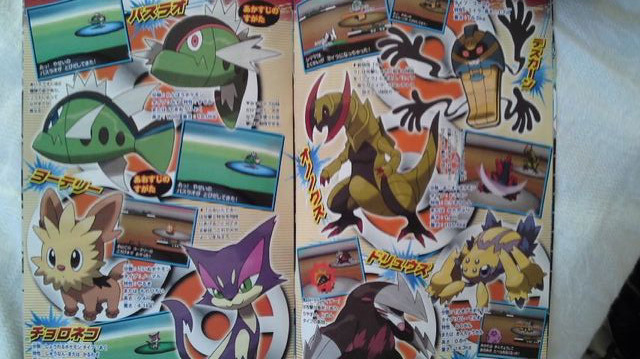 The October issue of CoroCoro has begun to leak onto the internet. The leaders of Sanyou City's Gym are featured, among many new Pokémon revealed. That's a little bit too early, no? So the first Gym has three leaders? What? From the scans, it looks like they are battled separately. Hoenn has 9, and Isshu has at least 10 for now. These two scans are on Pokébeach, should they be added to the article? So, it looks like we have a triple battle straight off the bat. Then again, the scan looks like u fight them one at a time, when their Pokemon were designed for triple battles...not too sure what to make of that. 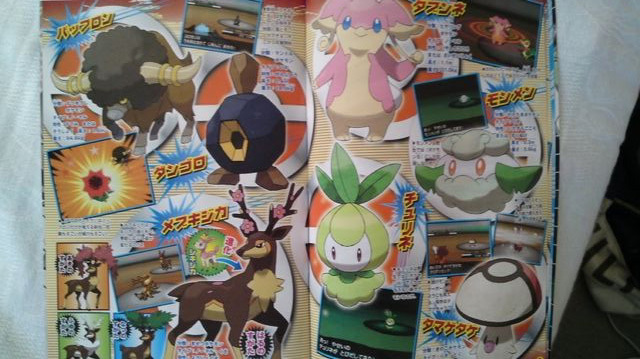 and the leader the player battles will depend on the starter Pokémon they selected at the beginning of the game. Rival's selection, take 3. They'll choose the SE one? Smartarse...that was added after I read the article. Not into Ponies I swear! This is all so very strange. I dread seeing all the complaints though. That wasn't part of the update though, it was there when the article was first published. Wouldn't that bull be the evolved form of Tauros? Well Pokébeach did say about 10 minutes prior to the publishing of this article that is was a triple battle, so I'm not surprised you got confused. Wouldn't that ox be the evolved form of Tauros? I thought it was only Gen V Pokémon until National Dex... which would pretty much mean it's seperate from Tauros. How do we know if those CoroCoro leaks are real and not fan-made? I don't know, this seems suspicious to me. However, I must say I like Desukan's design. Very intimidating. If he's a Ground/Ghost dual type, I'll definitely be using him often. All those new Pokemon on those pages look AWESOME!!! October CoroCoro comes out around the 14th of September. So not too early. Well, it could be a national dex Pokémon just like Rhyperior, Lickilicky, Porygon-Z etc. So we cannot be sure. And I think it would be terrible not to have any old-Gen Pokémon evolved form or pre-evolved form in Gen V.
Id like to know whats goin on with the spoink/mushroom with a pokeball on its head. Of course, I HOPE this leak is real, 'cause I'm sick of the fake ones.